Murickens Group An ISO 9001-2015 certified company has been in operation since 1975. We steps to Kerala Real Estate Consultancy. Through this business Murickens marked our name to the top in this field, with prompt and honest service. again turned to electronic field .Murickens has always been keeping a watch on modern technology and business attitudes. Keeping this in mind we entered in to Hi -tech business by manufacturing various state of the art of electronic products such as UPS, Invertors, Solar Invertors, Solar UPS, Solar Lantern, Solar Street Light, Automotive Invertors, Step-up and Step-down transformers,solar charge controller,solar panel etc. These products are manufactured under the registered brand name FLYLINE . 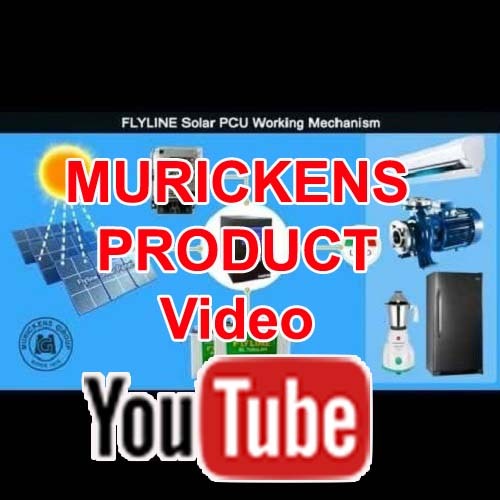 Achieving success in this field too, Murickens launched few more products in the brand name as MG. products include deep freezers, mobile mortuary, water coolers,Servo Stabilizers, Solar water heaters, room air conditioner etc. Today we are the number one particularly in Real Estate Business. All this happened due to our positive approach and business principles. We at Murickens have a clear and strict policy towards each and every aspect of business. So log on to our websites given below and be a part of our business. Besides the Head office at Kaduthuruthy, Muricken's Group now has offices at Ernakulam, Kottayam, and representatives at Mumbai and USA. For further information you can contact our Managing Director, Mr. George G Muricken.